All signs point to a youth-culture reinvention. American Spirit cigarette sales are through the roof, beer pong has become a hackneyed cliche, adolescents worship bizarre spectacle celebrities and a fairly well-rounded university education has become a commonplace, albeit expensive, adornment. According to data from the Department of Education, the number of college graduates in the United States has more than tripled since the 1960s. But with more educated graduates in the job field, a bachelor's degree takes on less and less import. Wrestling with pressures to succeed and a cultural tendency toward indulgence, a steadily increasing number of students in America are turning to drugs in an effort to hyper-focus themselves in a world where smart is quickly going crazy. The drug of the moment: Adderall. A recent study in the journal Addiction showed that in the student bodies of 119 prestigious or competitive universities, 25 percent of students admitted to having tried Adderall, a prescribed attention-deficit-disorder medication that doubles as one of America's leading "study drugs." In 2008, the National Survey on Drug Use and Health indicated that 6.4 percent of full-time college students have abused the medication. "Angela," a Sonoma County native who moved to the East Coast for her first year of college, knows the perils of Adderall all too well. 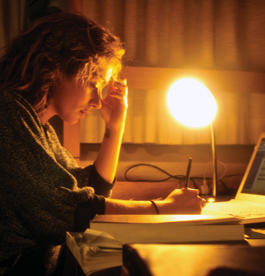 Just two weeks before finals, she left college to seek immediate treatment. "A lot of my friends took study drugs in college—sometimes to have fun, which was sort of looked down upon, but more commonly to get work done, especially essays," she says. Nonetheless, Adderall usage often goes beyond pill-popping the night before an essay is due to a daily routine. "Adderall combined with Prozac can be very dangerous, and many people I know indulged in that combination frequently," she admits. "Once, I took Adderall and drank a lot, and it was absolutely the most drunk I've ever been." Lisa Wyatt, director of counseling and psychological services at Sonoma State University, states that it's important to view Adderall as the powerful amphetamine that it is, with side effects ranging from depression and fatigue to decreased libido and anorexia—or worse. "It can induce a psychotic disorder," Wyatt cautions. "For people who are susceptible, it can introduce schizophrenia and bipolar disorder. It can do some serious neurotransmitter damage. I've seen it induce psychotic episodes," she says. Anorexia, depression, anxiety and psychotic episodes? Doesn't quite sound like the hormonally charged and alcoholically capped parties that typically characterize university social life. Yet all of these side effects began to play a large role in Angela's life later in her second quarter when, exacerbated by the ease of acquiring Adderall, they culminated in her undernourished, 90-pound frame being rushed to the hospital for immediate care during a psychotic breakdown. A recent study by UC Berkeley and the National Institute of Mental Health indicated that worldwide funding for ADHD medication increased by an astounding 274 percent in the decade between 1993 and 2003, with the United States contributing over 83 percent of that spending. Prescriptions for Adderall, naturally, have risen annually. "We're in such a 'when we want it' kind of culture that doesn't tolerate working through anxiety as a process," Wyatt says. "[We] just go to our doctor and get a pill and take it. Of course, that works in short run, but it doesn't in the long run. And I don't blame the physicians. I kind of blame our culture for pushing physicians to prescribe more drugs. I think, in turn, parents of students also look to these medications as a quick fix," she pauses. "We've really got a cultural problem, rather than a college-student or med-prescription problem." Now, after a two-month stay in a mental ward, Angela can finally sit back and look objectively at her situation. Drugs played a large part in her institutionalization, and now, with an arsenal of mood stabilizers in her medicine cabinet, they're playing an uncomfortably large role in keeping her out. Could it be that Adderall, a study drug used to produce the most productive results, is really just an inconspicuous stepping stone to a psychological cycle of nonproduction?